Face Off - Get your stinking paws off me, you damned dirty ape! This week's Face Off picks up right where it ended last week. 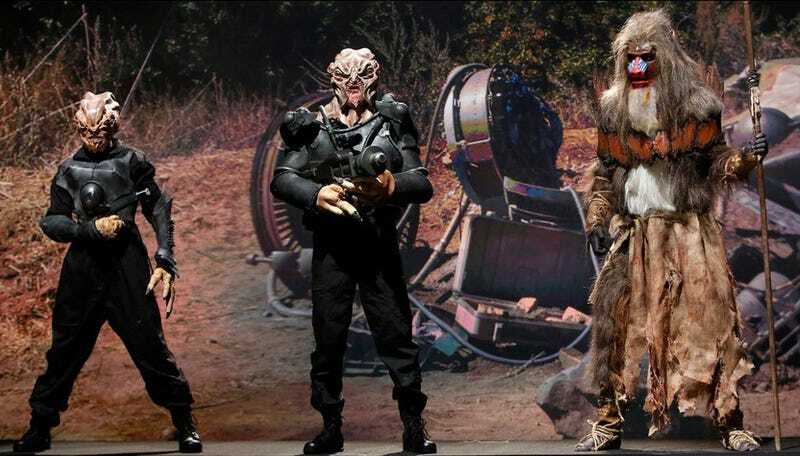 McKenzie Westmore threw a monkey wrench into the alien creature challenge by telling the contestants that the alien crash was on a planet ruled by primates. The teams have to make an additional creature but also get an extra day to work. Since the guest judge this week is Rick Baker, whose make-up credits include the Mark Wahlberg version of Planet of the Apes, the primate creatures need to be good. Each team adjusts their division of labor with the advice of their coach. Team Anthony's designs (top image) lands two team members in the bottom looks for the horrible sculpted hands and lackluster alien design. Team Rayce impresses the judges with both the insectoid alien and the elder monarch monkey. Logan was a key player in both creatures so he earns the first win. Team Laura is a top look for the middle creature above but also a bottom look for the primate that didn't look too much like a primate. Gregory didn't follow Laura's advice when she saw how poorly the sculpt was going and pays the price by being the first contestant eliminated. I see how the coaches help when the teams are working together but I'm still not sure how it will work when the contestants are working individually. Are they just giving advice like Michael Westmore? Since they have a stake in the outcome are they going to play favorites among their team members? I'll just have to watch and see.